Acrylic on Poplar panels. 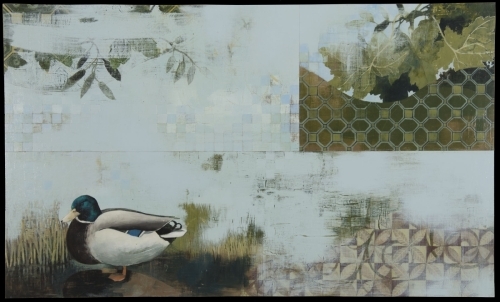 A lone Male Mallard in a geometric interpretation of wetlands. Acrylic on 8 Wooden panels. 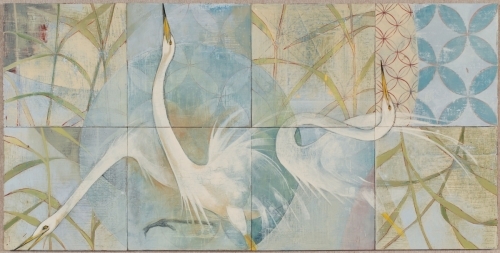 Three images of an Egret in stages of the mating dance in an abstract geometric meadowland. Acrylic on 9 wooden panels. Three Snow Buntings in various stages of changing from Summer into Winter plumage. Acrylic on 4 Birch panels. 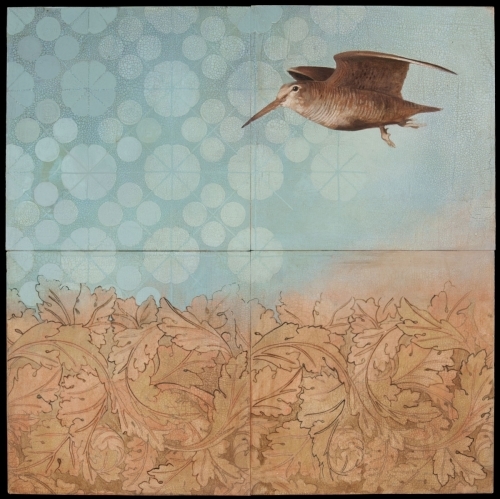 A lone Woodcock flies over a patterned, Autumnal landscape. Commissioned for a wedding gift. Acrylic on Oak panel. Male Cardinal portrait on a background inspired by French stained glass windows. Acrylic and Gold Leaf on wooden panels. Golden Swallows fly across a night sky in an abstract landscape of grasses and rich color. Acrylic on Poplar panel. 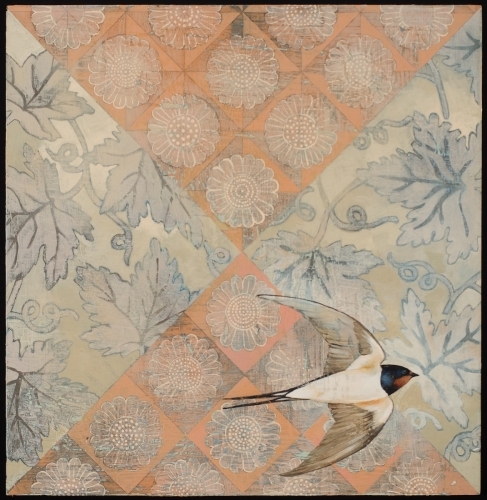 A Barn Swallow flies across a background reminiscent of quilted fabric. 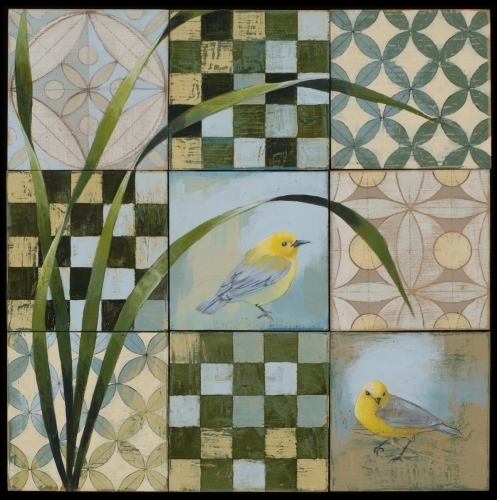 Acrylic on Poplar panels. Three panels create this painting of landscape seen from above. Shadows of birds float over the scene. Acrylic on 9 Birch panels. 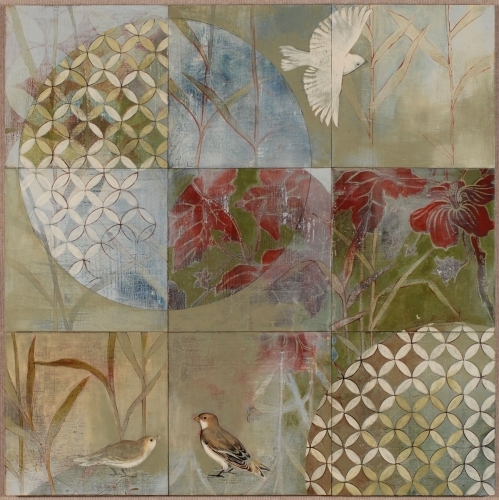 Checkerboards, grasses and circular patterns create a world for little birds. Acrylic on Birch panel. 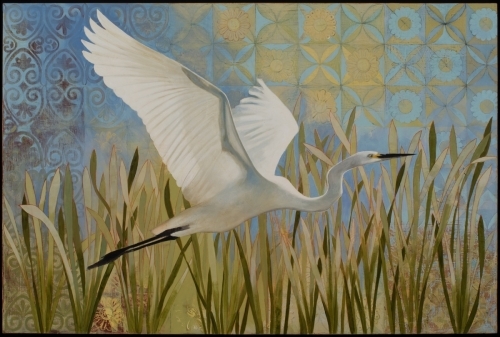 A Snowy Egret takes to the wing over a wetland landscape of patterns and grasses.